On the surface, Sao Paulo can't begin to compete with the spectacular sights of Rio de Janeiro, but underneath the grey, concrete exterior beats the heart of a vibrant cultural and artistic metropolis. Sao Paulo's artistic community is large, ensuring that there are many art galleries and museums scattered around the city. Clustered in neighbourhoods like Jardins, Cerqueira César, and Bela Vista, you'll find both local and international talent at places like the Luisa Strina Gallery, Arte 57 Escritorio de Arte, Choque Cultural Gallery, and the Museu da Tatuagem (Museum of Tattooing). Sao Paulo is also home to a number of interesting museums, including those dedicated to immigrants, the African Diaspora, the Japanese community, revolutionary heroes, and Brazilian language and literature. Sao Paulo is the home of Brazil's famous combination of dance and martial art: capoeira. There are several capoeira schools for tourists wanting to give it a try, including the Salão De Festas or Academia Spah. 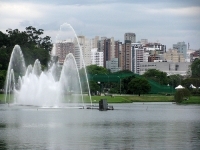 The city also has some notable green spaces, including the manicured Botanical Gardens, the Sao Paulo Zoo, and the miniature rainforest in the Parque Siqueira Campos. The Praça da República in the city centre is surprisingly green as well, with lagoons, a fountain, and a bandstand. Sao Paulo has many interesting buildings for architecture enthusiasts, including whimsical Victorian mansions in Bela Vista, and modern skyscrapers like the curving Edifício Copan, the colourful Instituto Tomie Ohtake, the Victorian train station Estação da Luz, and the Baroque cathedral Igreja de São Francisco de Assis. The Italia and Banespa buildings offer panoramic views of Sao Paulo from their viewing decks. Most attractions in Sao Paulo are easy to get to through a combination of walking and taking the metro. Pickpockets and muggings are common, but visitors are generally safe in well-populated areas during the day. We are looking for contributors for our Sao Paulo travel guide. If you are a local, a regular traveller to Sao Paulo or a travel professional with time to contribute and answer occasional forum questions, please contact us.